Another yard sale find, a Foredom clone and foot pedal switch. 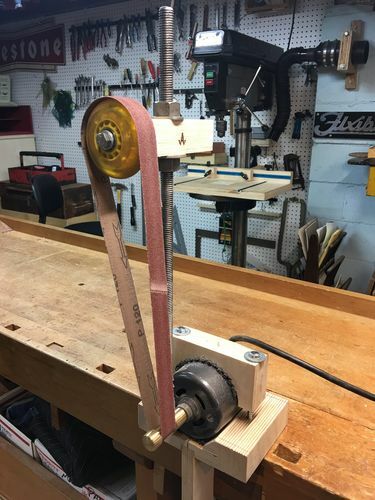 I wanted a 1” belt sander and didn’t want to buy one. 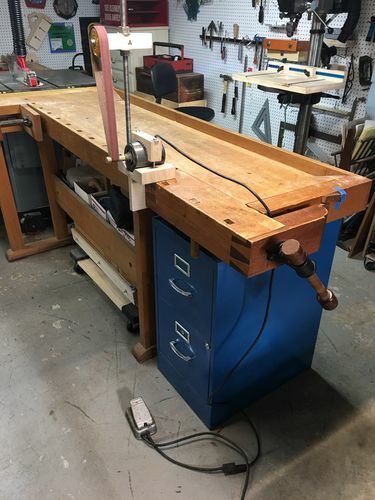 This has no platen or table, I have a belt/disc sander with all that. A pack of harbor freight sanding belts is the major expense. Adjust it up and down for tension, rotate it right and left to adjust tracking. 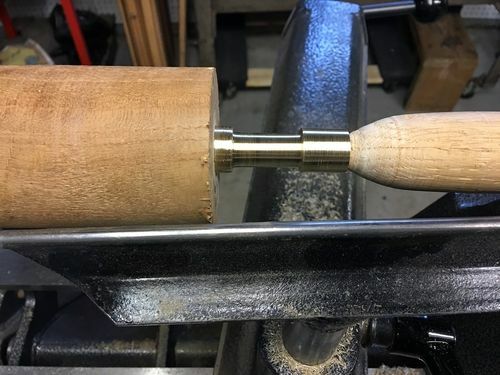 3/4” brass rod, I turned it on my lathe. Simplicity at its finest. Looks very useful. Wish you had posted this last month before I invested in a 1×42 from Jet. Good one Hairy, now I just have to find a junked foredom motor. It can’t get much simpler than that. Is that a roller skate wheel on top? Nothing short of fantastic. Simple and useful. Will have build one for fun. That’s an inline skate wheel. Any small motor would likely work. A trim router would be a good candidate, and still be a trim router, just make a mount. Well.. That is a pretty simple solution. Excellent! I like innovation, “the mother of invention”! Simple and effective, can’t beat that. I like the Homemade things well. I bet it does some things the commercial ones can not do; like -sand inside curves! Great idea—nice and simple. Well, except for turning your own brass drive shaft, LOL. Any idea how many feet per minute it runs? At max speed it might be a little fast for sanding wood. Can you run it slow enough using the foot pedal? Yes, the foot pedal is the speed control. I don’t know the motor speed, no data plate. The pedal will slow it down to a low speed.